This kit provides two-color fluorescence staining of both live bacteria (green) and dead bacteria (red) using two probes, DMAO and EthD-III. DMAO is a green-fluorescent nucleic acid dye which stains both live and dead bacteria. 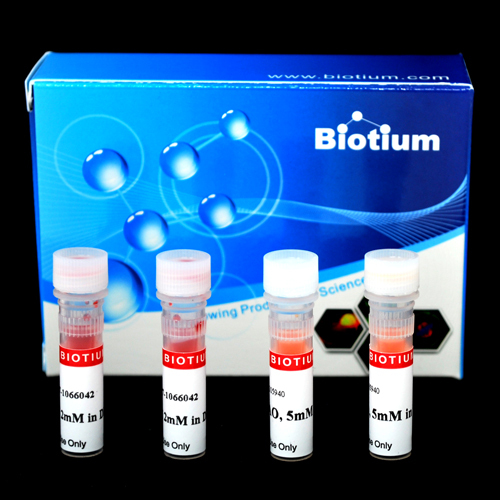 Ethidium Homodimer III (EthD-III) is a red-fluorescent nucleic acid dye that selectively stains dead bacteria with damaged cell membranes. When stained with a mixture of DMAO and EthD-III, bacteria with intact cell membranes show green fluorescence, whereas bacteria with damaged cell membranes show red fluorescence. The kit is suitable for use with fluorescence microscopes and flow cytometers. The assay principles are general and applicable to most bacteria types. For 100 flow cytometry assays or 1000 microscopy assays. Versatile: Analysis compatible with flow cytometers and fluorescence microscopes using popular settings for fluorescein and propidium iodide.